China is back in the market for U.S. soybeans after taking a holiday break, just as Washington and Beijing plan more trade discussions. On Wednesday, Cofco Corp., China’s top food company, was asking for prices, according to four traders familiar with the process, who asked not to be identified because talks are private. The inquiries were for February and March delivery, three of the traders said. Futures rose 1.3 percent in Chicago. There’s been talk of some purchases being made, with Chicago-based consultancy AgResource saying state-run buyers probably purchased about 1.5 million metric tons. Still, traders will be left in the dark as there won’t be an official confirmation due to the U.S. government shutdown. 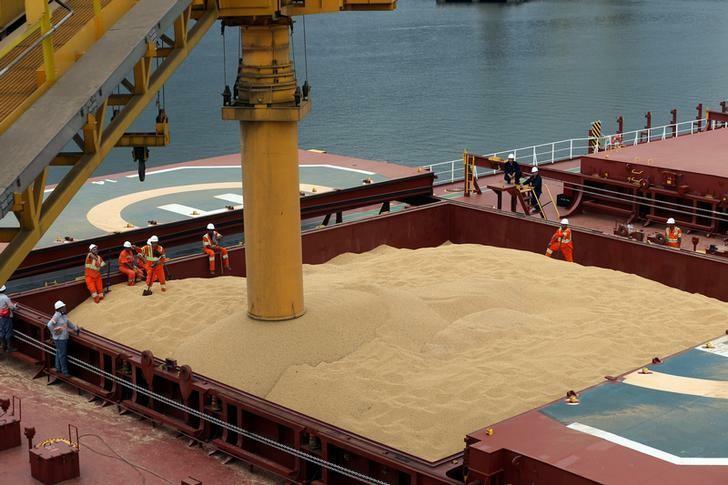 Cofco and state stockpiler Sinograin declined to comment. The renewed interest comes as trade officials from the two countries are scheduled to sit down in Beijing next week for the first face-to-face negotiation since President Donald Trump and his counterpart Xi Jinping agreed to a 90-day truce to their trade war last month. U.S.-China trade discussions are “coming along very well,” Trump said in a Cabinet meeting Wednesday. Bulk carrier Spitha is en route to China after loading soybean at the Export Grain Terminal in Longview, Washington, according to vessel tracking and USDA inspection data. EGT is a joint venture between Itochu Corp. and Bunge Ltd.
Chinese purchases will probably come from both the Gulf and Pacific Northwest ports and will be for delivery late spring, summer, Dan Basse, president of AgResource, said by phone Thursday. While China is back, U.S. cash prices remain stable, surprising some traders who expected the basis — the price gap between futures and physical prices — to move higher. “There’s such an abundance of cash beans in the market as of today in the U.S. that these kind of things, buying 30 million to 50 million bushels, is not something that’s even going” to be felt much in the cash markets, Basse said. Purchases are now being done by state companies and private buyers will only come back when tariffs are lifted, he said. Traders said Wednesday that there were still no Chinese bids for other feed grains such as corn or sorghum.